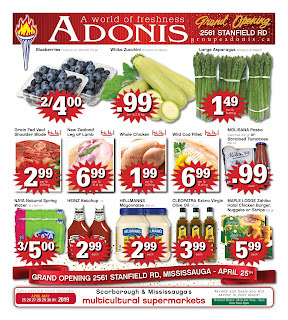 Find Marche Adonis Canada Flyer April 25 - May 1, 2019 for this week – Get all the latest specials flyers, deals, and coupons from Marche Adonis weekly flyer. Also, keep your challenge with coupons and great deals from Marche Adonis. The smartest method to save money by visiting Marche Adonis store, and there are a specials great deal in Marche Adonis flyer product. Find Marche adonis flyer quebec mississauga scarborough super montreal anjou canada laval in this category. International Grocery, Cheese, deli, frozen, meat market, olives & nuts, bakery, fish market, fruits and vegetables, dairy, prepared can be found at Marche Adonis Canada Store. Get Nescafe mocha or original coffee drink 240 ml price 3/1.00, ESKA NAtural Spring Water 3.99 each, Cedar Tahini 907 gr, Cedar Apricots Jam 250 mL 99 each, Valade Jam assorted 250 ml 2/5.00, Cedar Coconut Milk 399 ml only price 0.99 each,& much more. Meat Market Halal such as Extra Lean Ground beef - sale price 5.49 per lb 12.10 kg, Beef eye of round sliced or steak - sale price 5.99 per lb, Boneless chicken breast - sale price 5.99 per lb 13.20 kg, Marinated beef strips shawarma - sale price 5.99 per lb 13.20 kg, Beef tenderloin - on price 11.49 per lb 25.32 kg. Fish Market wild haddock fillet skin off 5- 7 price 5.99 per lb 13.20, Raspberry point oysters 12 un price 16.99 each. Variety and deals you will savour in your meals! For detail you can click on image flyer. 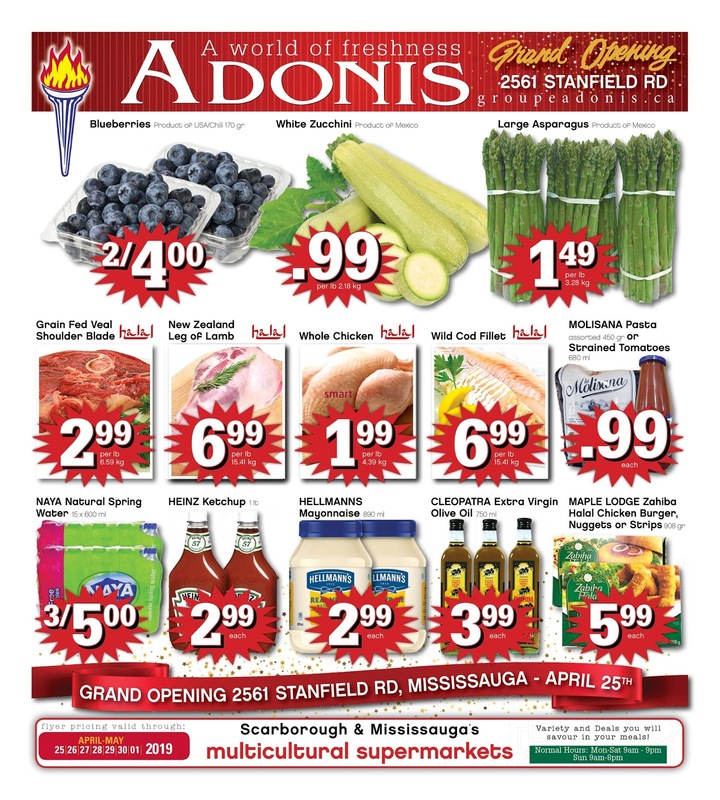 Save more this week with Marche Adonis. 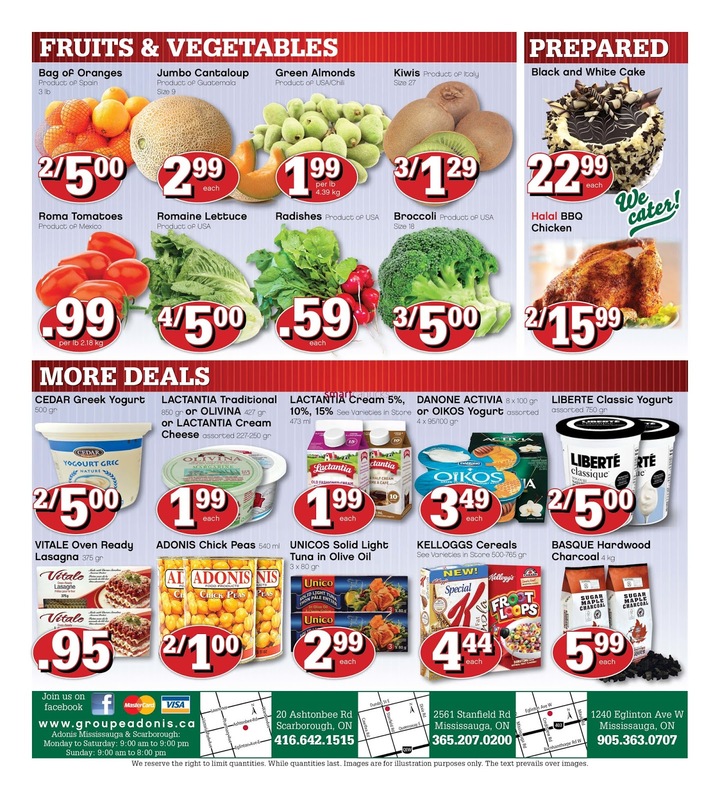 Grab these great deals at your local store and don’t forget to print off your local Marche Adonis coupon, to get the best deals. More detailed information can be found by clicking official website here. Enter a zip code or state to get all the information from the offers Marche Adonis store.